Opening & Artists Performances: Jameco Exchange. 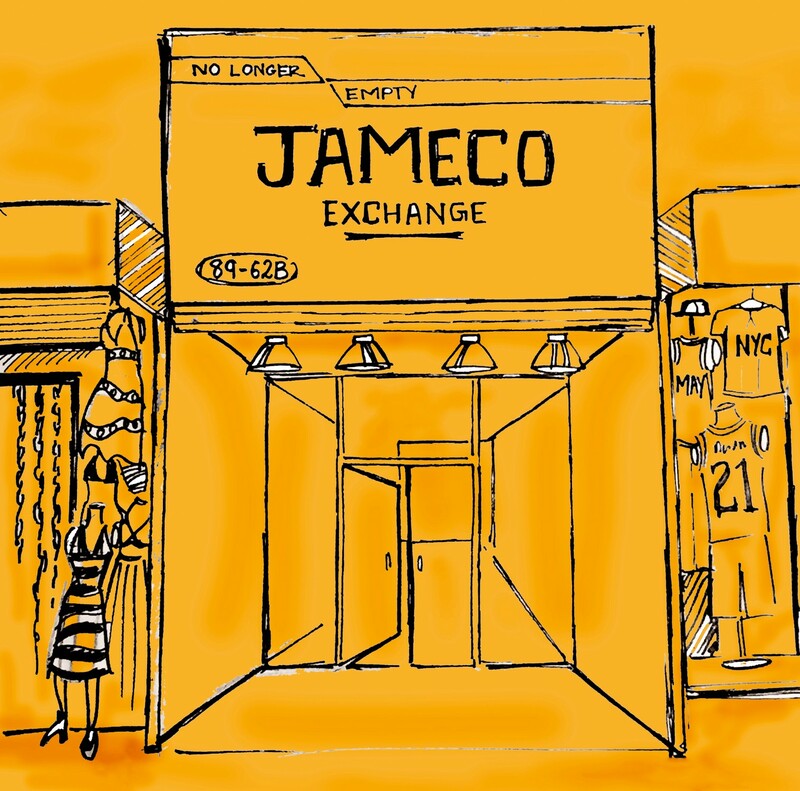 Please join No Longer Empty for the opening of Jameco Exchange, a site-responsive exhibition and socially engaged education platform that revolves around the art of storytelling about a place: Jamaica, Queens. Opening performances: 12 – 2pm, with a performance presentation by guest artist Hector Canonge at 1pm as part of his site-specific installation In Profundus. Canonge will intervene with the architecture of the storefront space, referencing the history of Jamaica, the diversity of its migrant populations, and the ever-changing landscape of the neighborhood to mediate on endurance, transformation, and ritualistic processes. At 2pm, André St. Clair, Gender non-conformist actor, writer, public speaker, producer and activist, will be the first African Diva performer inaugurating The African Diva Project Live!! !, a performative interactive installation by artist Margaret Rose Vendryes. Thereafter, visitors are welcome to take the stage and get their own African Diva on! Featuring site-responsive artworks informed by Jamaica’s global urban setting, Jameco Exchange is inspired by the retail vernacular of the storefront and the cobblestone pedestrian mall in which it is situated, the social culture of Jamaica Avenue, and the histories of Jamaica, Queens, through the lens of collective narrative. Jameco Exchange is curated by Rachel Gugelberger. Education and public engagement projects are curated by Sara Guerrero. Artists & Projects: Ibrahim Ahmed, Sol Aramendi, Kahiem Archer, Gabrielle Bendiner-Viani, Jane Benson, Hector Canonge, Carolina Caycedo, Stephanie Davis, Diego de la Vega Coffee Co-op (Gabriela Ceja + Fran Ilich), Nicolás Dumit Estévez Raful, Nicholas Fraser, Rico Gatson, Kimsooja, Local Project, Azikiwe Mohammed, Odathrowback, Richard Parker*, Antonia A. Perez, Calo Rosa, Juana Valdes, Mary A. Valverde, Margaret Rose Vendryes, Ezra Wube and Addam Yekutieli*. *An exhibition of works by Addam Yekutieli will be held at tattoo studio Think Before You Ink, with a response by owner, visual artist and tattoo artist Richard Parker; 167-16 Hillside Avenue, 2nd Fl., Thursday – Saturday, 12-8pm (closed July 4th). This project is in partnership with Jamaica Center BID and is supported, in part, by public funds from the New York City Department of Cultural Affairs in partnership with the City Council, Neighborhood Challenge Award, The Malka Fund, Wolf Kahn and Emily Mason Foundation, Robert Lehman Foundation and Greater Jamaica Development Corporation. We gratefully acknowledge the Community Advisory Council.